This article originally appeared as an exclusive first look at the RWBY statue; it’s been updated with new information since the statue is now available to order. Get yours here! Rooster Teeth, the pioneering entertainment and media company behind some of the biggest online series in history, is excited to announce a new project with award-winning McFarlane Toys, reimagining an epic battle from their worldwide hit anime series RWBY in a high-quality, limited edition cold-cast resin statue: The RWBY Alpha Beowolf Battle Statue. And as a fan of both the high-quality McFarlane collectibles and the fantastic animated series itself, let me just say that it looks spectacular. We’re happy to bring you an exclusive first look at the statue before it arrives in person at this weekend’s RTX 2018 in Austin, TX. 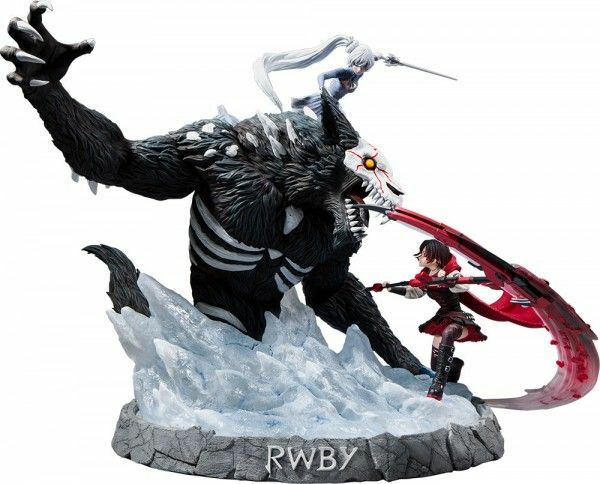 By way of background for this phenomenal RWBY collectible, huntresses in training Ruby Rose and Weiss Schnee have each fought their share of Grimm solo, but they’ll need to work together to overcome the might of a monstrous Alpha Beowolf! With her iconic weapon Crescent Rose in hand, Ruby slashes her way to the front of the fight on an icy battlefield. Meanwhile, Weiss springs off a summoned glyph for an aerial sneak attack using her deadly Multi Action Dust Rapier, Myrtenaster. At 12” high by 15.4” wide by 12.9” deep (!!! ), this fully sculpted statue exquisitely depicts all the action and drama of a RWBY battle scene. I particularly love the attention to detail in Weiss’ glyph and in the trail of Ruby’s scythe. 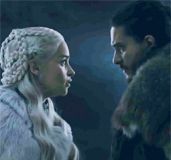 You can check out said details and find more to love in our collection of images below, along with info on how you can get your hands on this limited-edition collectible statue. The fully painted RWBY Alpha Beowolf Battle Statue will be available as a limited run of 950 this Holiday. In addition, an incredibly limited run of only 50 Unpainted Artist Proof, greyscale variants will be available for purchase – 30 online later this year, and 20 at the Coop, a pop up store experience across the street from RTX Austin happening August 2nd-5th that is free to the public. Each statue comes individually numbered with a certificate of authenticity signed by Legendary Artist and McFarlane Toys Creative Force, Todd Mcfarlane and Shawcross. The RWBY Alpha Beowolf Battle Statue retails at $550 (with free domestic U.S. shipping) and will be available exclusively online at the Rooster Teeth Store (http://store.roosterteeth.com). More info about the RWBY Alpha Beowolf Battle Statue can be found here: http://www.rwbystatue.com.